I usually tweet or Pin when I’ve seen something interesting online, but I’ve decided it is time to start sharing things on the blog again as it gives things more status and it makes stuff easier to find again. So I’m planning a series on other artists’ work as I come across things I like and other blogs that . 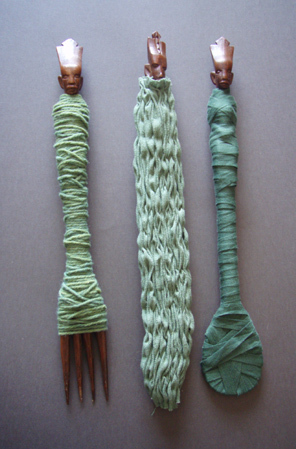 The Textile Arts Center blog is full of amazing stuff. I particularly liked the work of Lin Tianmiao probably because I am very attracted to the idea of wrapping. I also like the monochrome. 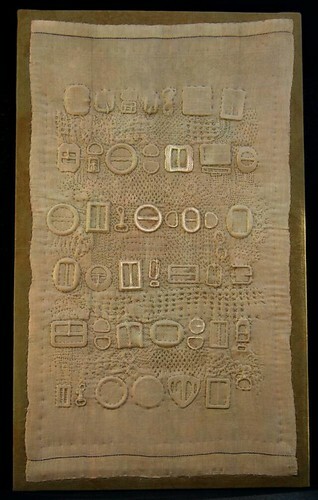 I recently discovered Diane Savona who embeds found objects in fabric. I particularly love this piece, again the simplicity of the colour works beautifully. A few years ago I made a small group of wrapped pieces for Figures of Africa, referencing museum collections, preservation and protection. I keep thinking about doing more wrapping but I wonder if it has been done too much already and I wouldn’t be saying anything new. Something to ponder.